The value of identifying women with an inherited predisposition to ovarian cancer has become readily apparent with the identification of the BRCA1 and BRCA2 genes. Women who inherit a deleterious mutation in one of these genes have a very high life-time risk of ovarian cancer (10–60%) and lesser risks of fallopian tube and peritoneal cancer. These highly lethal cancers are almost completely prevented by prophylactic salpingoophorectomy. BRCA1/BRCA2 mutation testing has become the accepted standard of care in families with a strong history of breast and/or ovarian cancer. This approach has the potential to reduce ovarian cancer mortality by about 10%. 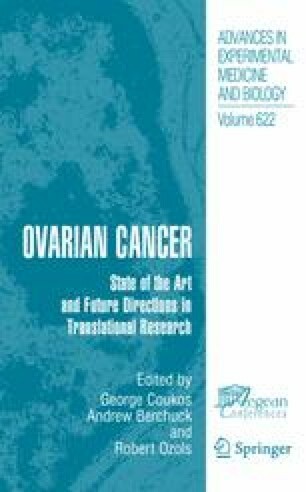 Although the ability to perform genetic testing for BRCA1 and BRCA2 represents a significant clinical advance, the frequency of mutations in these high penetrance ovarian cancer susceptibility genes in the general population is low (about 1 in 500 individuals). There is evidence to suggest that ovarian cancer susceptibility is affected by low penetrance genetic polymorphisms that are much more common. Although such polymorphisms would increase risk to a lesser degree, they could contribute to the development of many ovarian cancers by virtue of their high frequency in the population. It has been shown that the most powerful approach to studying low penetrance genes is an association study rather than a linkage study (1). Several groups have obtained funding to initiate such studies and these generally have focused on polymorphisms in candidate genes purportedly involved in ovarian biology or carcinogenesis.